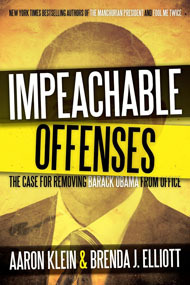 One may rightfully argue the following: the impeachment of Barack HUSSEIN Obama is pie-in-the-sky dreaming, in so far as he piles crime atop crime, yet he escapes punishment like Houdini. A fair assessment. Nevertheless, several valiant Congress members are pulling out all stops, something which would seem inconceivable even less than a year ago. And with Obamacare seen for what it is, as a bludgeon inside every family’s private sanctuary, well, a perfect storm is brewing on all sides. Just take a peek into this Congressional C-Span clip, and see how terrified Demsters are, regarding the fallout from Obamacare. Many of them are clinging to their seats – some of which are coming due in 2014 – like drowning people to their life rafts! One can find numerous warnings within intersecting commentaries at this blog site. To be sure, regime gone wild sews things up, to at least lead the indictment charge forward march…onward and upward…kadima…קדימה צעד – as we say in Israel. Alas, whatever shakes out, impeachment hearings are on the horizon and it is only a matter of timing. Either the American people will prevail, or Obama Inc.’s plans for America will come to fruition before given a chance to break his (and surrogates) back. There is no middle ground in this epic struggle for the free world. Undoubtedly, America will continue to be based on liberty and freedom, or it will not. This titanic fight can’t result in being “half pregnant”. An impossibility in all realms of reality. Indicative of a tyranny, police are ordered to squelch the most basic of freedoms; the right to free speech. To wit, anyone who dares to peaceably protest against the POTUS is threatened with arrest. Imagine that. Undoubtedly, this criminal regime will not go down without the bloodiest of struggles. If any comparison comes to mind, think of Obama Inc. as a gangster regime fighting for their very lives, their street cred, on par with the highest levels of criminal empires. Then, think of what they would do and transpose it to the goons running Washington at an exponential level – to the nth degree! More specifically, the regime has plans in place for such an outcome and rebellion. As a result, DHS and FEMA are prepping the camps. Laying the groundwork. Yup, you read it right….martial law and all ! For the video/audio inclined –http://www.youtube.com/watch?v=RUKpxcKhD3E….http://www.youtube.com/watch?v=ZViuts8RQRY – blue prints to DHS’s “strange” behavior. This entry was posted in Uncategorized and tagged Congressional C-Span clip, DHS and FEMA are prepping the camps, goons running Washington at an exponential level, impeachment hearings are on the horizon, Indicative of a tyranny, martial law and all, nyone who dares to peaceably protest against the POTUS is threatened with arrest, Obama Inc. as a gangster regime, Obama Inc.'s plans for America, Obamacare seen for what it is, regime gone wild, Stockman Seeks Special Prosecutor For Obama by Adina Kutnicki. Bookmark the permalink.